BDM would like to congratulate three of our management students for the completion of their Level 5 course in leadership and management. 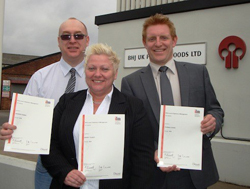 Distribution and Services Manager Mandy Talbot, National Account Manager Tom Cooke and Engineering Manager Andrew Homer of BHJ Uk Protein Foods Ltd have all achieved NVQ Level 5 Diploma. The Level 5 award is aimed at building effective leaders by improving the management competency of our mid-to-senior level students in order to maximise the impact they have within their organisation. Engineering Manager and Level 5 graduate, Andrew Homer remarked, "I no longer see myself just an Engineering Manager but an all-round Manager who can and does step into other departments as and when required. An example would be when the factory manager is away I will step in to look after production as well as engineering effectively looking after the factory. 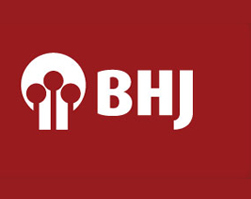 It is a very well-run course I would recommend it to any Manager looking to formalise there training." We wish the three managers all the success for the future and hope that the qualification leads to both personal and organisational growth.